I've got a few parts knocking around and I want to put them together and run a 3 speed* to run for work (sometimes) and to just mess about on when I want to. some spare sprockets (is that the right name) coming from 7 and 9 speed cassettes that are still ok....probably and which with a 44 front will give me the ratio I think will be good. Are these the same width? I can't get my head around spacers and how they work. I know I'll need to use spacers on the tiagra hubs but don't know what or how to work out what. So...any advice on what I might need or how to work out what I would need would be appreciated. Just don't tell me its a bad idea, I know this already. *For reasons unknown I don't want to ride fixed, I don't want single speed, I do want a 3 speed. Sprocket spacing won't be critical if using a non-indexed gear shifter (lever). Otherwise they will need to be spaced appropriately for the shifter and derailleur. You need to work out the total width of a normal cassette on your hub = n X sprocket-thickness + ((n - 1) X spacer-thickness), where n = the number of sprockets the freehub normally takes. Call this t.
Then calculate the width of your 3-speed set. Do the above with 3 for n. Call this s.
You'll probably want to have the sprockets roughly in the middle of the freehub, so the total thickness of spacers needed either side = (t - s) / 2. It will only need to be precise to within about 1mm, but add one or more thin 0.5mm spacers if it's a tad too thin for the lockring to lock. You can use any Shimano or SRAM sprockets butchered from any cassette compatible with that hub, and any make of spacers of whatever thcinesses you need. Metal spacers, if you can find any, will help to reduce flex. The amount of flex that a load of plastic spacers together will allow might be more than you want. 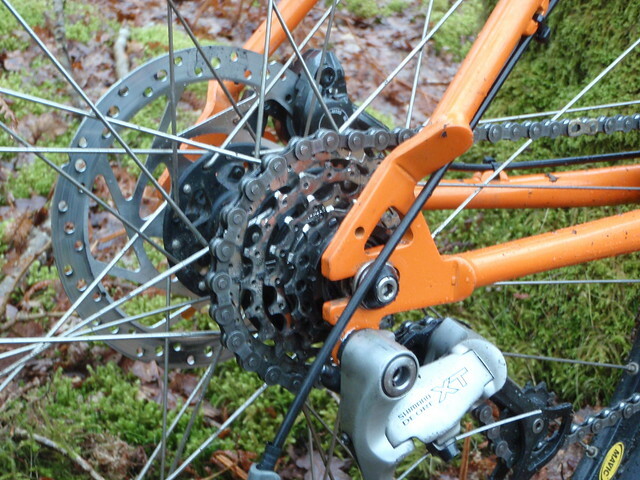 Use any "speed" of sprockets and chain you like. Just make sure there's enough room for the chain not to rub neighbouring sprockets. ....Just seen that Sheldon includes total cassette widths in his table, to spoil the fun. I'm not sure its so daft an idea though. Do you think there will be any problems with gaps in rear gears and shifting. I can't imagine I would be going up/down more than about 4 teeth at a time, and think shimano does this anyway on some of its megarange cassettes. Do you think there will be any problems with gaps in rear gears and shifting. Not serious ones. It just might be a little less slick shifting than the best. I imagine the derailleur's limit screws might need replacing for longer ones, by the way. I think I might be wrong about plastic spacers allowing too much flex. They will compress more than metal ones, but that won't matter once compressed. This is a 9 speed cassette that I've broken apart by drilling out the rivets, taking the ratios I want (14, 17, 21, 27) and re-rivetting with some of the original plastic spacers to create a wide-ish 4 speed cassette. Shifting is with a 9 speed Dura-Ace bar end lever on a thumbshifter mount - the bigger than normal gaps don't cause a problem. Why you'd want to bother though, I don't know. If you can fit a full cassette, it's probably much easier and just run 1x8/9/whatever. I only set mine up as above because I've got a short freehub body (singlespeed specific - but long enough for four or five cogs) on my MTB. I just about got away with screwing the low limit screw all the way in. You might need to replace it with a longer one depending on mech and cog sizes. Some people using similar setup have need to put a spacer between the mech and the dropout to shift the derailleur over enough to get the adjustment needed. The spacers are glass filled nylon, and pretty stiff. They will compress more than metal ones, but not enough to worry about. After all, they've been used in regular cassettes for years with no problems. You can get away with a length of plastic waste pipe cut to length if you can't find enough conventional spacers. Why not a Sturmey Archer? They're probably the nicest three speed hub. New ones don't have the gear slippage problem you remember from the seventies. SRAM do a fine 3-speed as well. But using this hub, the simplest might be to use a single sprocket and a triple chainset - why not? That way, you could get away with a simple tensioner rather than a derailleur. Spacers for singlespeed are easily available, and there'd be no drilling out of cassettes. I was born in the 70's so don't remember much from that time! I think I had one on a raleigh bomber (80's) but probably didn't do enough miles on it to worry about it sliping though! SA or SRAM would obviously work well, but I'd rather use the wheels I have and not have to spend too much. I thought that wouldn't run that smoothly. I did think about 3x1, and I think this might be the easiest. This weekend is taken up with mostly riding in the sunshine so probably put something together in the next couple of weeks when the snow arrives (apparently). I'll play aorund then and see what I come up with. I don't know the frame but it will undoubtedly be too wide for any of the older SA 3speed hubs and the new Taiwanese SA ones are not given away. I use an old (British) SA hub with the longest axle on my Gitane sometimes and it only just works by pulling the drop-outs in 2mm (from 130mm) and taking liberties with the amount of thread engaged in the nuts. There is also no system for blocking the axle correctly although so far this hasn't posed a problem for me (like it probably would on a 5 speed hub gear with a greater torque reaction in bottom gear). Best stick with the derailleur. Some SRAM cassettes are not rivetted but held together with a screw that screws into the top sprocket. Better still there is no need for the sprockets to be fastened one to the other since they are held together by the cassette body and the locking screw. it runs super smooth when set up correctly. i've ridden with 1x7 an 1x8 for a few years now including several mega distance audaxes. top time trialists use this setup as well. 3-speed is ok, but i find 7-speed ideal.